Please find below an inspiring article written by a recent student of Wagtail. 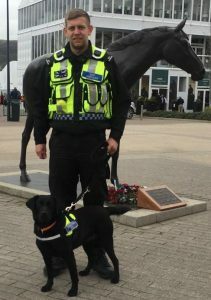 Dale successfully completed our Drug Detection Dog Handler Course. In 2008 I made the incredibly daunting decision to leave the Armed Forces after enlisting straight from school. Having established my career within the Royal Military Police, I deployed on operational tour to Iraq in 2004. On return it was my aspiration to join the Dog Section and become a GP Handler, however due to service cut backs, this was no longer an option and I served in other policing roles within the unit. Eventually I felt it was time for a change and decided on a career within a Police Force in civvy street. Having successfully passed the required assessments for the Police, things were on track to a bright future as a police constable. It wasn’t until I entered the world of civvy street that things took a turn for the worst. I was struggling to adjust to civilian life and my mental health was deteriorating rapidly. Not long after, I was diagnosed with PTSD brought on by an incident in Iraq that I was lucky to escape with my life. That said, years of torment blighted my life and I have struggled to settle within any employment opportunities that came around. Years later, I finally sought the help I needed in order to establish some sort of stability in my life. I engaged with Military Veterans service and went through intense therapy. I was then referred to a veterans charity Walking With The Wounded (WWTW) who assist injured veterans in finding suitable employment. It was there that I learnt of a company called Wagtail UK Ltd, who are incredibly supportive of Military Veterans. This reignited my passion for Dog Handling. Quickly contact was established with Adam Vizard from Wagtail via Tom Knight and Gary Lamb at WWTW. Keen to support veterans, it didn’t take long for Wagtail to organise an interview, with the view of sending me on a work placement in France. I attended this placement and had a fantastic time working alongside Handlers within the ferry ports seeking out clandestine attempting to enter the UK illegally utilising cargo transportation and coaches. This was a great experience, however it soon became apparent that my lack of knowledge within the dog handling industry meant I wasn’t suitable for this role at that time. Undeterred, I went back to the drawing board and liaised with Tom. Wagtail explained that they hold courses for those wishing to become handlers. I attended a Wagtail Taster Day, where I had the opportunity to explore the options available. This was a very informative day with a relaxed atmosphere surrounded by handlers who were only too happy to assist. I witnessed presentations of various dogs throughout the day, which included drug detection, explosives, tobacco, cash and conservation dogs. At the end of this day I had made up my mind that I wanted to train and qualify as a Drug Detection Handler. Walking With the Wounded started negotiations with Wagtail and sourced the funds required to attend this course. 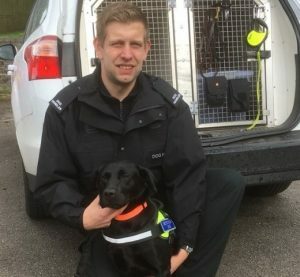 Throughout, Wagtail couldn’t do enough to support this process, eventually I was booked on the Level 3 Dual Purpose Drug Detection course, where I was allocated a professional instructor. This course was 3 weeks long and was very intensive, throughout I gained as much knowledge as I could possibly obtain and put theory into practice. Wagtail organised live operations with local police forces and a large manufacturing plant, who I was entrusted to work independently with. This was fantastic and gave me much more of an insight into handling outside the classroom environment. As I opted to go self-employed, I required a dog and as I am somewhat inexperienced, it made sense to acquire a trained detection dog. Wagtail procured a dog for me and advised me of the most suitable dog for me. Eventually I was teamed up with a black Labrador called Widgeon. Wagtail identified her potential and spent several months producing an effective working dog, training her to detect all substances that I requested. She can now detect the presence of Cannabis resin / bush, Cocaine, Crack cocaine, MDMA, Heroin, Methamphetamine, Amphetamine, Ketamine, Methadrone. Having completed my reteam with Widgeon, it was less than a week before myself and Widgeon would be put to the test. I was offered employment by Security Facilities and Support and tasked to work Cheltenham Festival. On the busiest day some 86,000 people attended. Each day saw a consistent number of attendees throughout the four day period. This was a mammoth tasking for a green handler and dog team. However, it soon became evident that we were both up to the task. We secured many operational finds to include Cannabis bush, Cannabis grinders, cannabis cigarettes, cocaine, crack cocaine, MDMA and ketamine. I received very good feedback from the organisers and this has paved the way for what I believe will be a long and successful career opportunity. I have finally found after all these years, I now have a sense of purpose and this has helped me establish my place in the civilian world.